Rembrandt was a Dutch painter and etcher, born in Leyden. Until 1631, Rembrandt worked there and in The Hague and thereafter in Amsterdam. Son of a Calvinist miller and a baker's daughter from a Catholic family. Rembrandt received a classical education at the Leyden Latin School, which he left shortly before finishing the 6-year course. Rembrandt's 1st 2 masters both worked in Italy - firstly, Jacob Isaacsz van Swanenburgh, the black sheep of a Leyden clan of artists and civil servants and secondly, the Amsterdam Catholic Lastman. Due to his background and training, Rembrandt began his career with a certain degree of learning, considerable familiarity with early 17th-c. developments in Italian art and a multi-sectarian perspective in a society where religious affiliation was extremely important. Rembrandt's earliest major recognition came from Constantijn Huygens, the secretary to the Prince of Orange, dilettante musician and medallist, and an important poet and correspondent in the Republic of Letters. Huygens saw Rembrandt as the Dutch answer to Rubens - a local artist capable of raising the reputation of Dutch painting to the highest level. He declared the young Rembrandt to be superior even to the ancient Greeks with his ability to integrate accurate observations of emotion into themes of universal applicability. Thanks to Huygens, Rembrandt and his Leyden colleague, Lievensz achieved fame when they were still in their early twenties. 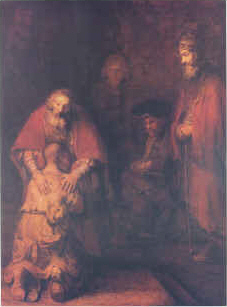 Rembrandt risked - and in the event lost - his connection at court in order to pursue a commercial career in Amsterdam. There he became the partner of the Mennonite art dealer, Hendrick Uylenburgh, whose studio earned money from art through various activities. Rembrandt became the artistic director of this workshop, which supplied the ''upper'' end of the portrait market. Rembrandt himself set a new standard for Amsterdam portraiture with his Anatomy Lesson of Dr Nicolaes Tulp (1632). The bond with Uylenburgh was consolidated when Rembrandt married his niece, Saskia (a Frisian Calvinist).